Going to your dream destination has to be the most memorable day of your life. You’ve always wanted to visit the country and now you finally have the chance. It took you months of planning to set everything up and decide on the things to take. The preparations were exciting enough but then things just went wrong. You carefully selected the clothes you wanted to take with you and the last thing you wanted was a mess. But that’s usually what happens when you get packing without a proper plan. The cases are filled to the brim and as a last resort, you push them shut. This tug of war isn’t the way you imagined your dream holiday would start. If that wasn’t enough trouble, you realized you accidently left your keys inside the case. All of your efforts go to waste as you rummage around the case. All the neatly folded clothes are now a mess and you’d have to start again. Don’t worry. Most travelers face this problem but the experts have found a solution. The secret lies with the best travel bag, the Pro Packing Cubes – 6 Piece Lightweight Travel Cube Set. These organizers and compression pouches are the ultimate solution to your storage needs while travelling. Do you want to know more on how you can make packing easier for you? The Pro Packing Cubes has an array of features that can add simplicity and convenience to your travels. Size – It comes in 3 sizes. You can use the large one (17.5 x 12.75 x 3.25”) for towels, sweaters, trousers, and light jackets. The medium ones (13.75 x 9.75 x 3”) would work well for shirts, shorts and even documents. The smallest size is a slim, rectangular shape (9 x 3.75 x 3 in) and you can use them for shoes, undergarment, electronics & toiletries. Style – The best travel bag is available in great colors. The smooth lining feature adds style to the overall look of Pro Packing Cubes. Quality – Pro Packing Cubes are made of high quality and durable rip-stop nylon. This feature ensures that your belongings are safe from harm. YKK Zippers – Many of the luggage sets you own become unusable after their zippers fail. The cases might be made of stronger material but the zippers are usually not durable. Pro Packing Cubes however ensures the durability of both material and zippers. Reinforced seams and YKK zippers make Pro Packing Cubes the best travel bag. Now you don’t have to worry about broken zippers or weak stitching. Perfect Fit – It is perfect for people who are frequent travelers. The cubes are designed to perfectly fit into most airline carry-on suitcases, tote, backpacks and even duffel bags. Easy to clean – The cubes are washable so cleaning them is quite easy. You can treat any stains with detergent and then wash the cubes. No more worrying about dirty luggage! They are easy to clean and provide the best option for organizing your belongings. These two features alone are enough to make this the best travel bag. Mesh Front – The durable zippers make sure that your belongings are compressed and hence occupy less space. Even though the top portion of the bag is made of mesh, it does compress your belongings. The mesh also helps you keep track of your belongings. Since they are see through, you can easily determine the belongings you packed in each cube. How’s that for convenient? Collapsible – When you’re not using Pro Packing Cubes you can easily store them. They are 100% collapsible and that’s what makes them the best travel bag. Most travelers want to enjoy the holiday and not worry about the statistics of packing. If you too want that peace of mind, you’ll surely invest in the Pro Packing Cubes. The set offers a lightweight and durable alternative to your ordinary luggage. You can use them to sort clothes by outfit or garment type. This organizing will help save time and inconvenience. YKK zippers and durable reinforced seams make sure your belongings remain safe throughout your trip. The feature that makes Pro Packing Cubes the best travel bag is the convenience of packing. You can save significant storage space by organizing and compressing your belongings in the travel cube set. Even though the Pro Packing Cubes provides the ultimate ease when packing, some users were not satisfied with the compression claim. They found that Pro Packing Cubes is best used as an organizing set. So if you are looking for compressing cubes, Pro Packing Cubes might not be the best choice. 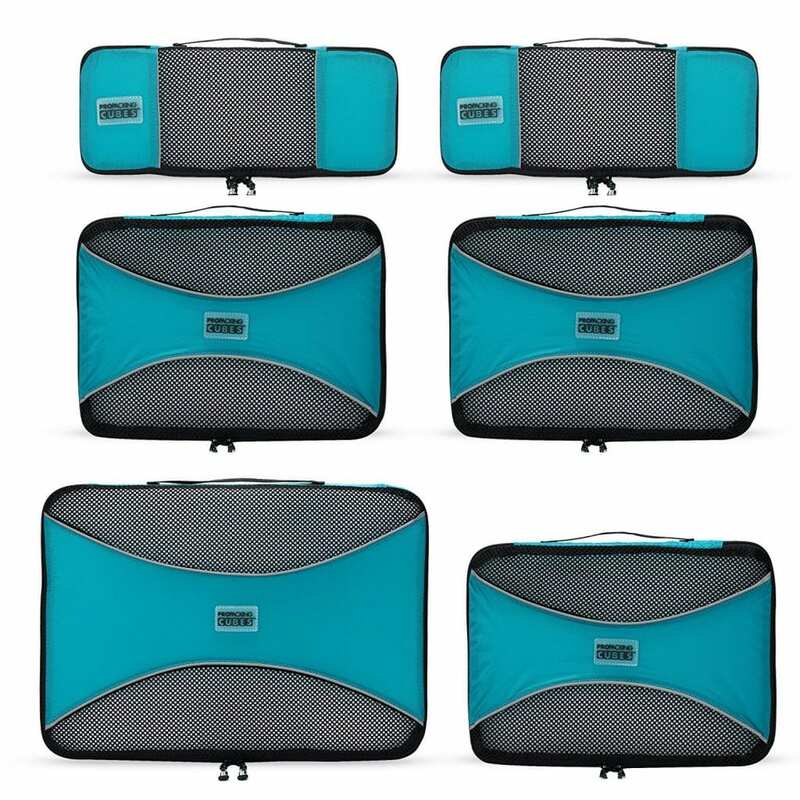 If you are tired of your messy packing antics and want to organize your belongings, the Pro Packing Cubes – 6 Piece Lightweight Travel Cube Set is the most convenient option. It’s a simple device that can make your life so much easier. It might not have great compression abilities but it can help you organize your belongings.